All orders are accepted and processed on the basic of the conditions stated below. The purchaser acknowledges these through placing his order. Other conditions are valid only with our written permission. All our prices are quoted per piece, ex works Burk/ Germany. On all our prices as shown in our catalogs we afford a permanently discount rate. All offers are without engagement and exclude the statutory Value Added Tax. Our prices do not include any grants for value dates, subsidies for advertising costs and catalogs. Our quotations are always subject to change. For orders we send you confirmation of order within 2-3 days after order. If you do not receive a confirmation, please contact us. Your orders will be processed within 2- 3 weeks, ex factory, unless other delivery time have been agreed. For running time of forwarders we cannot give any grant. All our quotes are ex work (EXW). Shipments are effected to the account of the purchaser, unless other conditions have been agreed. We reserve the right to make partial shipments and over – or under -shipments up to 10%. 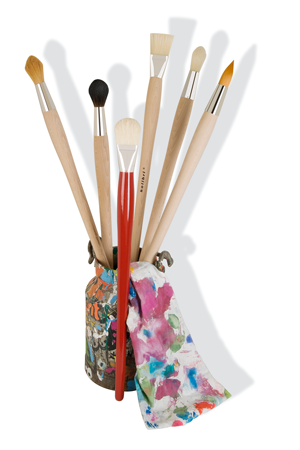 All our brushes are sold in Packing-Units as stated in our catalogue or as stated in our quotation. We have to charge additional 10% when buying less than one Packaging-Unit, unless other conditions have been agreed. For shipments within the European Union: The invoice amount is due for payment as below: Payment before shipment less 3% cash discount or within 10 days of the date of invoice less 2% cash discount, or within 30 days of the date of invoice net-net. We cannot accept checks and payment by credit-cards. For oversea-shipments we ask for payment in advance after order confirmation and proforma-invoice. For initial orders from new customers we ask for 2 Trade references that we are able to contact by fax or by telephone. In addition please submit a Bank reference. Otherwise delivery will be made against bank guaranty, irrevocable Letter of Credit or agains payment in advance only. All goods delivered remain our property until the complete amount is paid, also in case of processing and reselling. The claims of the purchaser which arise from any further disposal of the goods are hereby now transferred to us as security for our own claims. Complains only can be made within 8 days from receipt of the goods and must be notified to us in writing without delay. If they are justified, we will replace the value or the brushes. Further entitlements for compensation cannot be accepted. Place of performance for all liabilities shall be D-91596 Burk, Germany. The court at Ansbach, Germany, shall have jurisdiction over both parties. Unless otherwise agreed is essential the law of the Federal Republic of Germany. The full version of our terms and conditions we will send on request to you.